Intuitive user interface design failure… when a doorknob isn’t. Sometimes, designing an intuitive user interface takes only stepping away from the project, and trying to think about how someone else might try to use an object. Most of the time though, you really need to see how the interface is used in the real world. The very best example I can think of this involved a so-called “inactive” doorknob. It was the door to a closet in an apartment that I rented. For nearly two months, I was unable to open the door, instead thinking that perhaps management had located a hot water heater or some similar utility behind the door, locking it away from tenants. It looked like a doorknob, but it didn’t act like one. It didn’t turn, and it didn’t latch. Instead, I found the doorknob worked like a handle on a cabinet rather than the usual doorknob. One needed only to give the knob a firm tug and the door would open. On paper, and to those that installed the knob, it probably made perfect sense. 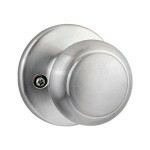 But to me, who had never seen that kind of doorknob, it was not an intuitive interface. These are the kinds of things that can be easily worked out through user testing.